The lightning speed at which teamLab releases new work is mindboggling. Seriously, it’s hard to believe anyone in the collective even sleeps. Coming off their recently released Crystal Universe, the Japanese artists are back with yet another interactive light installation set in the ruins of Shizuoka City’s Sunpu Castle. A gridded network of 108 white balloons, or “globes,” floats in mid-air, creating a pyramid shape that resembles the roof of a house. 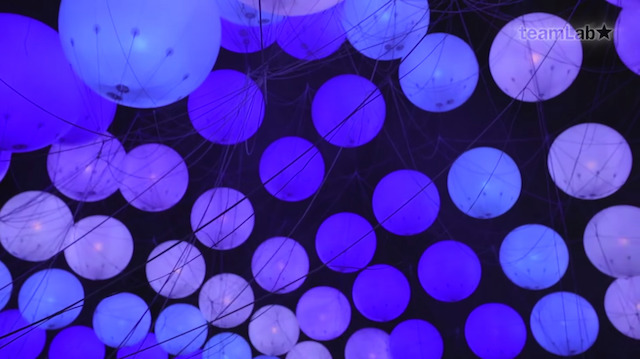 The floating spheres change color when touched and emit a sound “unique to that color,” according to teamLab’s description. The surrounding balloons then echo the same sound and color in a rippling effect that alters the entire color of the piece. The site-specific installation was constructed in dedication to Tokugawa Ieyasu, the founder and first shogun of the Tokugawa shogunate in Japan, who built and died in the Sunpu Castle. Can You Escape This Hypnotizing VR Labyrinth?